Trying to encourage our kids to clean up after themselves without turning into the giant nags we swore we never would become (gulp) can sometimes be a challenge for parents. It’s definitely something I’ve struggled with. Kids live their lives in the moment, with fun, curiosity, and play pulling them on to the next thing and then the next. Cleaning up the first thing before heading off to the next thing takes some training and a boatload of patience on the part of parents. If you’re tired of the sound of your own voice asking for the 1,000th time—”Precious angels, please put your shoes in your closet,” and “Please pick up your clothes you’ve adorably thrown to the floor and put them into the hamper,” and “For crying out loud, little darlings, please put away your Legos. Please. Pretty please!”—then I’ve got some new strategies you may want to try. Beyond relieving the frustration of the recurring mess is the importance of teaching our children how to love and care for their space. We’re looking at a key life skill here, and we parents are tasked with providing those. Spring cleaning is a great opportunity to steer this train in a positive direction. The larger projects you might be tackling this time of year offer chances to engage the kids on this issue and involve them in an effort that will result in great satisfaction. Rather than just surprising kids with, “Stop what you’re doing. It’s time to clean!”, tell your kids that next Saturday (or whenever works for you) you’re going to make the playroom look amazing! You can talk it up with specifics about the vision of what an amazing playroom would look like. They would have more space to play, more open tabletops to draw on, less clutter, more room for future toys that may arrive someday (wink, wink). The vision of a successful result will be motivating and may even get your kids excited about your impending cleaning day. Break large tasks into bite-sized pieces. So, using the example above, aim to clean the playroom on Saturday, not the whole house. When Saturday comes, break that task down into even smaller pieces. For example, before breakfast, you’ll pump them up about getting the bookshelf cleaned and de-cluttered. Then celebrate the completed task with lots of praise and high fives, and take a break for breakfast. For big tasks, jump in with them and help to make fast progress. Seeing the work easily done and progress quickly made will keep kids from feeling overwhelmed. My kids love any kind of art project. As you aim to declutter, give them three boxes and instruct them to label them: “Donate,” “Store,” and “Keep.” Tell them they can decorate each box however they wish. They’ll be more enthusiastic about engaging with the creations they just made when the task of sorting through their things begins. Send them off to put away as many toys as they can within five minutes. Set the timer on your phone and have them count how many. See who can make their bed the fastest. If they clean their room within 15 minutes, they can watch their favorite TV show or have a simple treat. 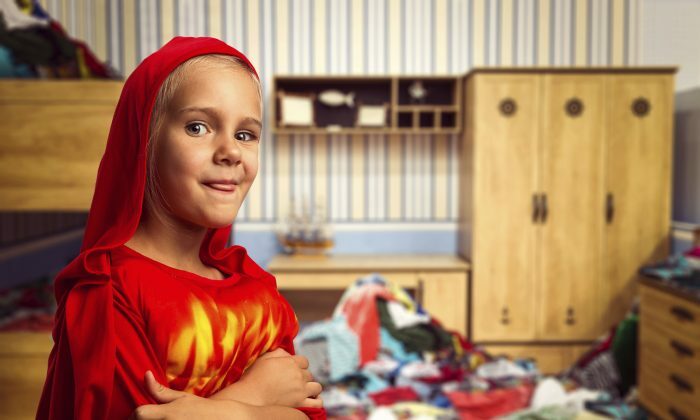 You know what motivates your kids and differences in age will call for different strategies here, but “gamifying” cleaning is a quick way to make progress with fewer complaints. No, really. If you’re tackling an entire room that could use some sprucing, you’re likely going to need some new containers to store things in or corral what you’ve got. Give containers as gifts to your kids for their own spaces. Explain what you hope they’ll use them for and be open to their suggestions for their use as well. Toss that perfectionism out the window and celebrate the positive in what your kids do accomplish. Resist the urge to rearrange, refold, or redo their work and instead tell them how proud you are of their effort. Whether you end up with one clean shelf, one clean room, or an entirely clean house, celebrate the success you’ve all achieved together. Your kids will definitely experience the clarity of mind and peace that comes along with decluttering and cleaning a space. Revel in that with them. Aim to have them associate that positive feeling with cleaning in the future. Whether you’re trying to build a professional empire or design your ideal family life, these tips are sure to inspire you to manage your time wisely.